Energy and Calm: Change It Up and Calm It Down! Incorporating brain breaks and focused-attention practices into the school day can invite novelty and quiet while boosting students' brain health and knowledge acquisition. Unlike the sequels to movies, I hope that part two of last year's Energy and Calm post will continue to strengthen your understanding of how our brains naturally learn, think, and behave. So let's return to the calming yet energizing zone of focused attention practices and brain breaks, a place that would greatly benefit students -- and their teachers -- when revisited frequently. Our brains prioritize survival above learning and emotion. Because our circuitry for survival is so strong, we pay attention to everything that feels threatening, unsafe, and unfamiliar. For students, this may apply to new standards, testing, complicated topics, personal struggles, and challenging relationships. These perceived strains can neurobiologically create a stress response state in our brains. In a fight-flight-freeze response, our ability to think clearly, stay focused, and problem solve shuts down. Research repeatedly shows that quieting our minds ignites our parasympathetic nervous system, reducing heart rate and blood pressure while enhancing our coping strategies to effectively handle the day-to-day challenges that keep coming. 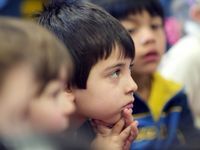 Teachers in all grades have found these quieting practices helpful during various times of the day, although the most popular intervals are still first thing in the morning and at the end of the day. These practices, like any new skill, take much persistence and patience. Sitting up nice and tall with both feet flat on the floor, take three slow, deep breaths down to the belly, breathing in through the nose and out through the mouth. Count to four on each inhale and five on each exhale, with a slight pause between the inhale and exhale. Following the three deep breaths, we then slowly turn our heads to the right on the inhale and left on the exhale. This movement is slow and deliberate. After two times each to the left and right, we then inhale while lifting our chins to the ceiling and exhale as our heads slowly move downward, touching our chins to our chests. We can repeat these movements or add our arms, the opening or closing of our hands, or any gesture that could move with the breath. Students close their eyes and choose a small object out of a junk box or bag. This could be a paper clip, pencil, apple core, stick, leaf, eraser, pair of glasses, sock, piece of string. . . or anything! For one minute or less, students keep their eyes closed and focus on the object through their other senses. Even though they might recognize the object, they should concentrate on the feel, texture, shape, angles, smell, or any aspect they notice. Following that minute of focus, the students can share the details, verbally describing what they noticed, or writing down their findings. Teachers could also throw the descriptions into a basket, and at the end of class or the day, students could select a description, guessing what the object is based on the written words. The brain responds to what we imagine as if it is an actual event. Feeling safe, peaceful, and connected with others are states of mind that can generate positive emotion and ease in critical thinking and problem solving. In our focused attention practices, we quiet the brain with safe place visualizations. The students sit quietly, closing their eyes as we verbally walk them into their favorite imaginative place. We then direct them to envision the sights, sounds, colors, and feel of their own safe place. They can invite anyone they choose to be with them, or they can rest and enjoy this space on their own. This has been the favorite focused attention exercise of the students who practice this skill. For two minutes, students close their eyes and listen for all the sounds around them. Once they have identified a sound, they capture it in their own way, such as envisioning a box around it or placing an imaginary x on it. Students then share and compare the sounds that they heard and captured. Routine lulls the brain to sleep. Depending on our age, we have a limited amount of time to stay focused and attentive. To learn, connect, memorize, and retrieve information, we must be awake and focused. The following exercises implement novelty and fun, creating the curiosity that our brains crave. Describe your favorite food to a partner for 30 seconds using only adjectives. After your partner guesses, she describes her favorite place with adjectives, and you will do the guessing. Write your name on a piece of paper first with your eyes closed, and then using the opposite hand. Compare the differences. Share and discuss. With a partner, create your own secret language. You can add sounds to words, remove first letters, add "-ing" to the end of words, etc. The teacher can model this to begin the break. A magic carpet ride awaits. This carpet will take you to the two most important people or places in your life. Who are they? What makes this ride so significant? For 30 seconds, count as fast you can, replacing every third number with the word "pop!" Then your partner begins counting, and on every sixth number, he says "gotcha!" Place a pair of shoes on a table at the front of the class. Students will have one minute to describe what it might be like to walk in those shoes. The owner could be someone who angers or scares the student, or someone whom she simply has a hard time understanding. Priming the brain for learning and positive emotion is critical for continued social, emotional, and cognitive development in our students’ lives. Brain states that invite novelty and quiet are instrumental to students' brain health and knowledge acquisition as we work through these practices and incorporate them into our day.